How long until dbl digits for XB1? Quantum mechanics allow at least a low triple-digit number to tunnel from distributor stock into homes even through solid concrete walls every week, with no actual sale process ever taking place. So basically highly improbably ever. Really hope it gets a price drop. It seems like a good enough window of opportunity, and Resident Evil Res2 + Neptune VII are also coming out early next year as well. Wow. Looking at the games all laid out makes it pretty clear PS4 will be destroying WiiU next year. What's the deal with Wii U? I assume its largely due to a lack of games. Last year it seemed that Wii U sales did get pretty strong in November/December, though. Anyone get the feeling Zelda is going to be nudged into 2016? Though if they can deliver it next year and still have big games to look forward to for 2016 - well good for them, just dont see it happen. I'm ready to bet the game is coming out in 2015, rushed or not. They'll have some titles for 2016, but that'll probably be the last year of support, and likely to be like one of the Wii's final years. 2-3 great games (SMTxFE, some old IP like the Diddy Kong Racing 2...), some small on the side (Pushmo/NES Remix tier), but not even a really good one per month. Even if it a Majora's Mask game came next year, that doesn't eliminate the possibility of the Wii U game. Ocarina of Time 3D and Skyward Sword were the same year. As were Wind Waker HD and A Link Between Worlds. PS4 wont destroy anything in Japan. WiiU is a failure and considering the support the PS4 wil be getting its hw sales also will okay at best. One bigger title from Nintendo like Animal Crossing WiiU in spring couple with a price drop will probably be as effective as this PS4 "revival". Bloodbourne, DQ Heroes and FF Type + HD with the demo will be the real important releases. Everything else is nice, but no one will llose their sleep because Dead or Alive. New 3DSXL selling the same than last week. And still facing stock problems. Continued stock problems for the XL model lead to believe that Nintendo, like most people here, expected the smaller one to have higher demand, and weren't prepared for the opposite. I don't know why. Bigger screens for handhelds and mobile devices have been a trend for years. I hope the 4DS goes for a uniform screen size, and that its the size of the XL. So many good games. man if only Feb/Mar for the PS4 in EU was like this. Anyway the feb/mar lineup being so stacked makes me wonder whats in store the rest of the year for PS4. Uncharted 4, Hot Shots seems likely, Tekken 7 maybe, don't know much else, even WW. What are the chances FF15 making it? RE7? GT7? Chris, have you ever tried to do some proper time-series analysis on your sales data? Are you sure that is PS4? Many games in this list won't make big difference in Japan, ven if we don't count the multiplatform factor. Define much better. I'm genuinely curious. 18k-20k imo, which is still bad, but not abyssmal. What does it say that the PS4 TEW sold almost better than PS3? That if there's no previous fanbase for a title, it'll have a higher chance at selling better on PS4. We saw that with new western IP debuts like Watch Dogs and Destiny, which had PS4 debut higher than PS3 (though that gap got smaller). 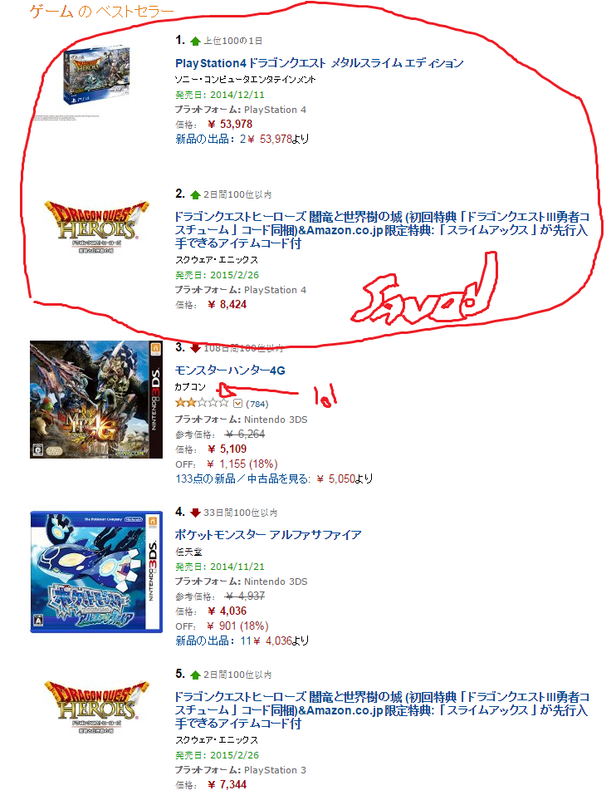 The Japanese franchise games have been heavily skewed to PS3, though. What's the justification for the PS4 version of The Evil Within to cost 1500 yen more than the PS3 version? 2K licensed two of the games for PS2 and Wii. They were released under the MLB Power Pros name. Konami did a western mobile game for the WBC a year or two ago as well. I don't expect the verb destroy to ever be appropriate for the PS4 in Japan. But the returns on those "one big title" releases have progressively diminished, as the market that needs a home system just to play Nintendo's stable is progressively saturated. The last one managed to get the system to just under 20K for like a week, followed by a rapid subsequent dwindling back down to the 10K mark and then 5K mark, just before the announcement of bundles. I would have thought by now it would be taken as consensus that, no, a few big franchises interspersed by extensive software droughts isn't as effective as sustaining sales as a more consistent release schedule. The 3DS has the benefit of both mega-franchises and regular releases maintaining it's dominance. The PSV is essentially kept afloat, such as it is at least, by regular small releases. While the Wii U has a few large well-known properties, but little else to pad the schedule and has consistently sunk back to these levels because of it. There was also a DS one that was localized but they cut out all the sim/mgmt stuff. I still wonder why the Powerpro Kun Pocket series hasn't continued to 3DS? They'd probably be big sellers relatively. US + Canada 3DS hardware = ~85% of Japan. Performing half as well as a kiseki game is not "doing well" for psycho break. Great avatar. Love that album. Physical or shipped? If it's physical I guess they are using Media Create numbers, right? Those aren't shipped figures, they don't match up with the other stuff they released, so it's likely their internal estimates. ...can we estimate Canada 3DS hardware off of this? Wait is the 85% thing for LTD or for recent sales? Has to be LTD right? *published by Spike; not a simultaneous release. Yes, it is LTD. Just don't know if until September or last weekend, but it doesn't change much. So if not for the n3DS, US+Hat would have finally beat Japan. Sigh. It's a countdown clock, so it's definitely mobile. PS4 saved this holiday season! By holiday season do you mean Chinese New Year? People said the same thing about Mario Kart 8 and that sold fine. Shouldn't Persona 5 drop Q1 for PS3/4? Thought it was supposed to be out Winter '14? Surely though, when that is out sales will be huge. Everybody loves Persona. Persona 5 got pushed back to some time in 2015. You know zero, I really love the enthusiasm in your posts even when it's being sarcastic. We really need more of that in Media Create threads. (Note I'll be using the word "sold" interchangeably for "shipped"). Kind of interesting to note how Pokemon X&Y shipped only 50K copies the past 6 months in Japan, but shipped about 980K to the rest of the world. Thus X&Y have now shipped 13.29M copies, which seems to be bigger than the shipment of Heart Gold & Soul Silver. There's still 2M more to catch up to B&W, and 4M to hit Diamond & Pearl, but it's still freaking impressive. I think Youkai Watch's popularity has deflated Pokemon's legs in Japan, but with the lack of YW it remains popular in the rest of the world. You know zero, I really love the enthusiasm in your posts even when it's being sarcastic. We really need more of that in Media Create sales. Sarcasm is the glue that holds sales threads together. Right it was previously going to release at the latest Feb 2015, however it seems the PS4 release has resulted in a delay? There's still a chance it comes out by then, the time between revealing the gameplay and releasing the game in previous entries was 4 months, however I am now expecting something like Spring or even Summer. Persona 5 would be the perfect summer title. Looks like PS4 Dragon Quest Metal Slime Edition is already sold out on Amazon Japan. Happy to see Chaos Rings III sold another 7k. It seems to have had some good word of mouth. Also great to see Vita hw up to 13k and powerful pro baseball vita selling 50k! It seems to have some good discount at price. totally missed that info :/ was there an offical statement? We've had no official word on the release date but the latest trailer did not say winter 2014 (which lasts till Feb 2015). Have you tried fitting a Error Correction Model (ECM) or some time-series model to the historical sales data to see whether future sales can be predicted by past trends? Would be cool to see whether the series is co-integrated, and to test estimate the relative effects of shocks to the sale series data (holidays, release of exclusives, bundles, release of "supersoftware"). using data for other consoles one could also estimate the relative effect of price cuts. I thought it had been long agreed that Konami's decisions with their sports franchises have no logic. I don't understand the lack of Pro Evo on Vita, and I don't understand the lack of Jikkyou on 3DS. In addition, we are continuing our approach on enhancing convenience for consumers who have purchased the download version of a game. Until now, consumers were required to turn on the game platform and enter the download code at Nintendo e-Shop to play the download version of a game purchased at an online shop, which created a usability issue. From now, by entering the Nintendo Network ID (NNID) and password at the time of purchase at an online shop, the game will be automatically downloaded through the SpotPass feature, without requiring consumers to enter the download code at Nintendo e-Shop on Wii U or Nintendo 3DS. This function makes possible, for example, purchasing a game at an online shop while being away from home, and enjoying the game soon after arriving home, without having to wait for the game to be downloaded, which would be completed by then. This function is available at Rakuten Books and yodobashi.com starting today, and it will be available at other online shops, including Amazon, in future. I'm interested in knowing how it's executed on Rakuten Books and yodobashi.com, if it's possible. P.S. hiska-kun, it's time to post those new Famitsu download and retail + download charts! New 3DS XL sold out on Amazon, new stock on Nov 3. Interesting, so US+CA sell through @91% of "Americas" shipments. <9% Americas shipments made up by Latin America (taking into account inventory in the channel of US+CA then 5% seems like a reasonable estimate for Latin America). So looking at Americas being made up of; US: ~86%, CA: ~8%, LA: ~5%, which is in line with what I expected.